As a few of our projects start hitting the finishing stages, office sites visits have been popping up on our calendar. Today about half of the office gathered bright and early in St. Francis Wood to check out a home that’s set to be move-in ready within the next two weeks. The project of interest is a full remodel of a single-family home constructed in 1916. The original designer, Henry H Gutterson, designed 83 homes in the St. Francis neighborhood, combining revival-style architecture with his own personal tastes. Being located on a prominent double lot provides the house and yard considerable space for San Francisco. Our tour began on the bottom floor in what used to be part of the basement but has since been excavated and converted into the family room. The lower floor also houses a guest suite, office/gym, and a large playroom for the entire family with access to the backyard. Despite being lower than ground level, large clerestory windows allow for natural light to stream into the space. After donning our paper shoe covers to protect the reclaimed teak flooring, our group headed up to the main floor to scope out the great room, kitchen, living room, and dining room. The southern wall of the great room was pushed out and a deck was added for more living space. A fireplace sits along the west wall, with ventilation sneaking up from behind the TV to the roof. A second fireplace can be found in the living room, along with a few light fixtures that got our designers talking. The top floor houses three kids’ rooms, as well as the master suite. 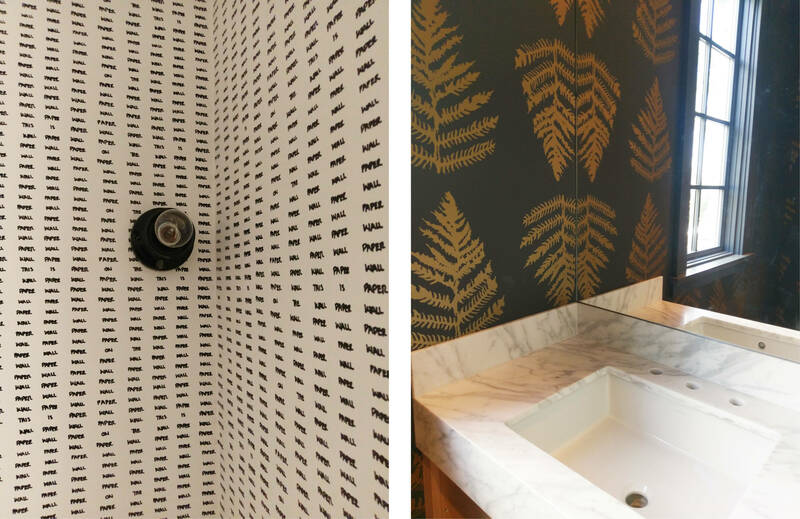 The color scheme throughout the house is soft and minimal, sans the creative bathroom wallpapers (our favorite was the leafy gold main powder room). Alongside the stair, a gorgeous wall of reclaimed cedar climbs steadily upwards toward the ceiling, a simple backdrop to what will soon be a beautiful chandelier. Unlike our last office site visit, this house had so much to see. Thus, our tour “group” split off into smaller pods of people, based on interest and walking speed. Chris and I took the time to walk around the exterior as he explained the level of excavation that took place to create the lower floor. The back retaining wall is still in process and the landscape has yet to be started, but it’s easy to see how all the pieces will come together. As we were leaving, one of the client’s children appeared looking for his dad. After asking one of the construction workers if he could enter the structure, he received the answer “of course! It’s your house.” Perhaps once the finishes go up and the scaffolding comes down, it’ll feel more like a home. 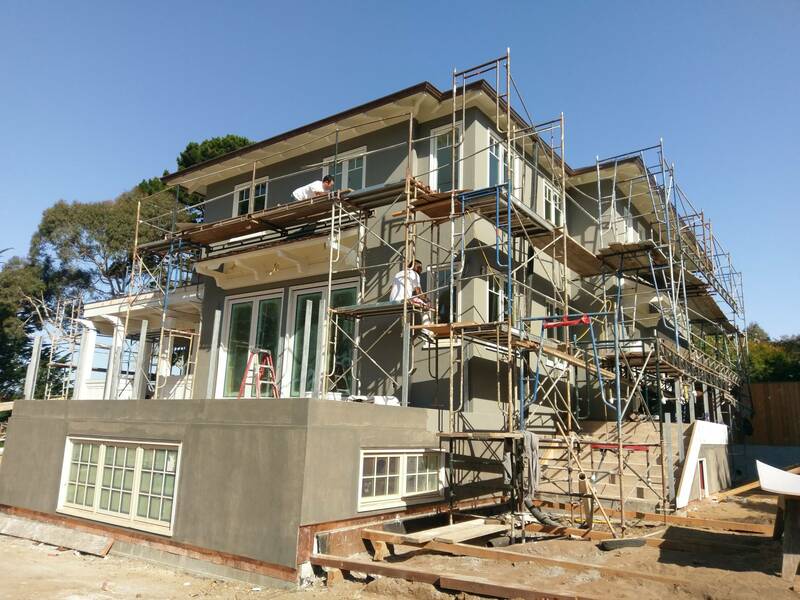 It’s always interesting to see projects in different stages of construction, besides simply through photos. There are a few projects on the boards that are coming together, so hopefully we’ll visit some of those next. Stay tuned! 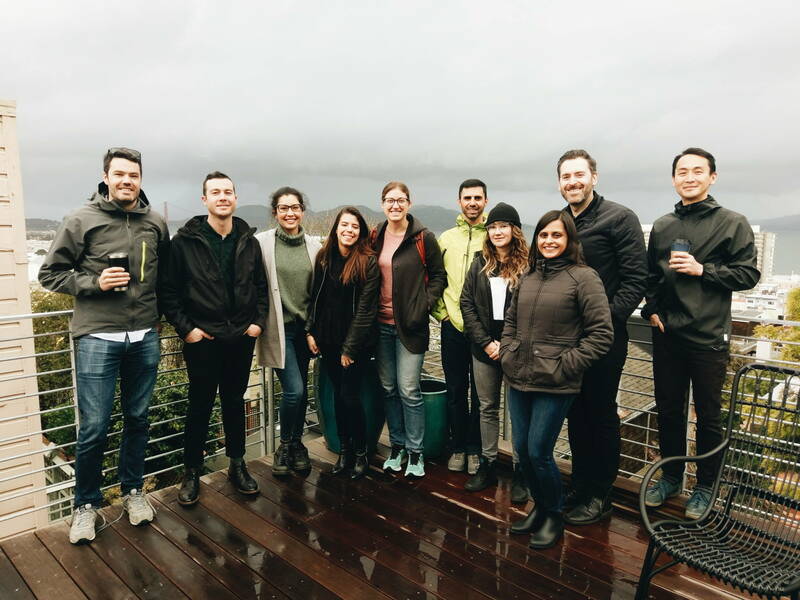 The birds were waking up on a drizzly Friday morning when the staff at Feldman Architecture gathered coffee-in-hand at one of our local project sites. Conveniently located just a twelve-minute walk from our new office, the recently renovated condo sits tucked away in the rear of a shared lot on Russian Hill. The original home, built in 1895 was of a single story with a small storage attic. In the 1930’s the home was lifted and an additional story was added below. 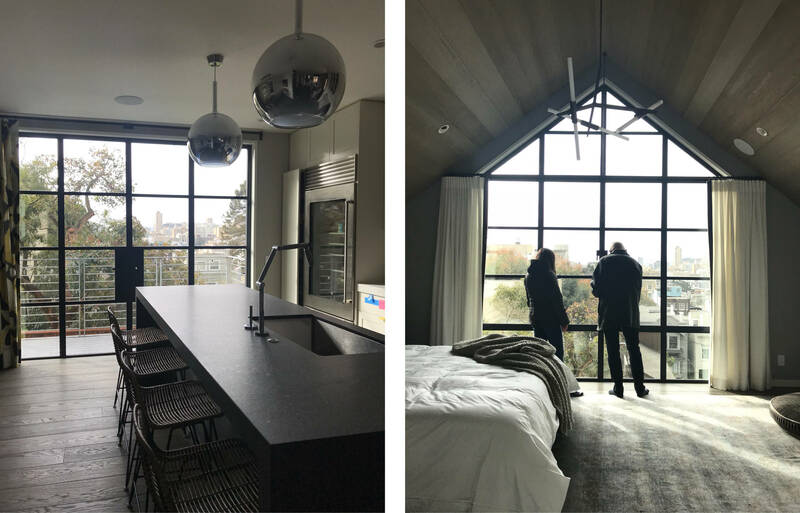 As part of the remodel, the attic space was lifted to create habitable space, a complete 3rd story with a cozy loft and roof deck that offers views of the entire Golden Gate Bridge. Chris and Jess led the tour through the house, starting with the bottom story bedroom and snaking our way up the twisted staircase. Almost all rooms in the house have gorgeous floor to ceiling steel windows, crafted by Architectural Iron Works in San Luis Obispo. During our short visit, the clouds opened up to drop a quick downpour which I personally found beautiful to watch through the glass panes. The entire condo feels homey and comfortable, exactly what you’d want on a dreary day in the city. Two large dog beds sit in the corner of the master bedroom, offering a clearer picture of the cozy comfort the homeowners must experience. Once we’d all gathered on the top floor, a group photo was taken before the rain started up once more. From our vantage point, we were able to watch the clouds get closer, and listen to the drops hitting the skylight above. Of all the things to grab the staff’s interest, the thermostat became a topic of discussion for a solid five minutes, before the group moved downstairs to discuss the merits of a glass door refrigerator. Soon after, Jeff, our in-office weatherman, notified us exactly when there was to be a break in the storm, which is when we gracefully made our exit. Having joined the firm just three short weeks ago, this was my first experience on-site for any of our projects, completed or otherwise. I’m looking forward to visiting many more in the future, hopefully on sunnier days!